Authors are requested to submit their manuscripts electronically and post the same at maths@icastorindia.org Electronic text files should be in Microsoft Word or PDF format, typewritten on A4 size paper (210 x 297 mm) with minimum margins of 25 mm on all sides, and in single-column, double-space format. All related materials including tables, charts, graphics, photographs, etc. are to be sent with the manuscripts. Authors can send their manuscripts by post also. In that case, they are to send 3 (three) copies of their manuscripts, typed on white A4 size paper (210 x 297 mm) on one side only with double spacing and minimum margin of 25 mm on all sides. All related materials including tables, charts, graphics, photographs, etc. are to be sent with the manuscripts. One electronic version (as an MS Word or PDF file on a CD/DVD) must be sent with manuscripts. Tables, charts, graphics, etc., if any, should be made on separate pages. They should be numbered sequentially and made to fit the printing area (130 x 180 mm). The numbers of such tables, charts, graphics, photographs, etc. must be typed separately in sequence in the appropriate space of the manuscript paper. Each manuscript must be accompanied by a signed letter of submission stating that it has not been published elsewhere, and that it has not been submitted simultaneously for publication elsewhere. Manuscripts are accepted with the understanding that all persons listed as authors have given their approval for submission. Please note that it is mandatory to send the letter of submission. 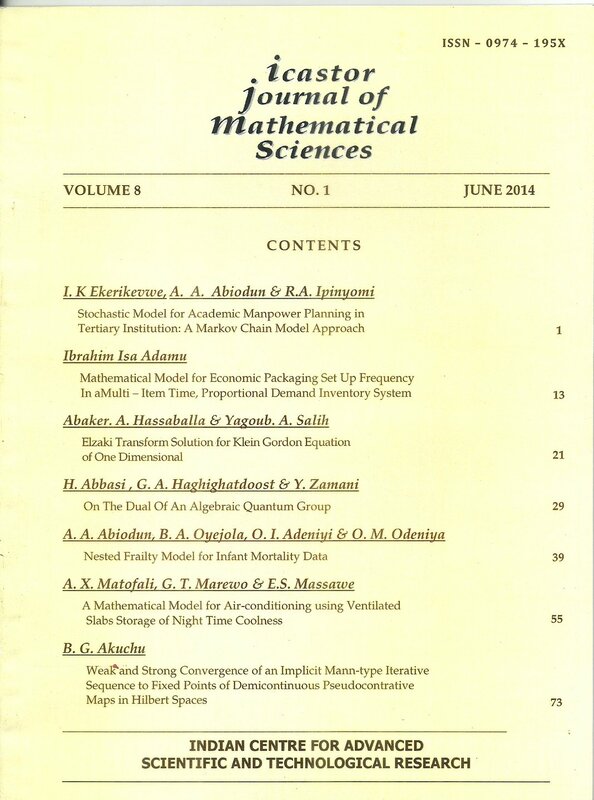 Publication of a paper in ICASTOR Journal of Mathematical Sciences is subject to its acceptance by our panel of esteemed referees. The decision of this panel must be regarded as final and conclusive. Contributions must be in English. It is not possible to return the manuscripts in case of revision or rejection. The title should be informative, brief and precise. A brief abstract of the writing (in about 300 words) followed by an introduction is required. A list of keywords should also be given. The use of Système international (SI) units as primary units of measure is mandatory. ICASTOR as well as editor(s) and members of the Editorial Advisory Board will not, in any way, be responsible for the views expressed by individual author(s) in articles published in the journal. In order to alleviate part of the publication cost, an invoice will be sent to the author(s). The author(s) shall be responsible for payment of such invoice. Postal charges will be charged extra in case of print version. 10 (ten) free reprints without covers of their work will be sent to the author(s) in case of print version. If required, additional reprints in multiples of 10 (ten) will be available against order and payment in advance.